Size: 3.4" x 5.5" x 0.65"
Texas Instruments introduced with the Galaxy 67 in 1992 a calculator based on a very powerful microcontroller in the package of the Galaxy 9x and Galaxy 40x. 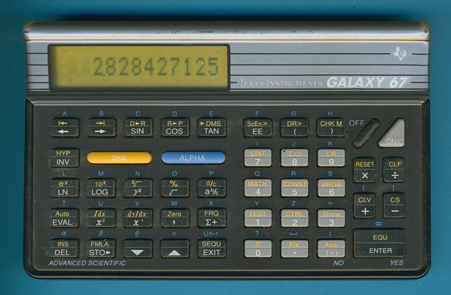 This unusual Galaxy 67 manufactured in May 1993 sports a yellow LC-Display but is otherwise identical with the original version. Dismantling this Galaxy 67 reveals no differences with the original design. The TMP0620F Application Specific Microcontroller is based on Toshiba's TMC17C architecture, a rather simple 4-bit kernel. Unfortunately is no further information of this interesting chip public available. © Joerg Woerner, March 22, 2014. No reprints without written permission.